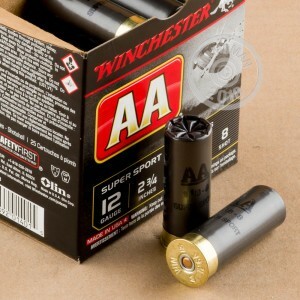 This high quality 12 gauge ammunition from Winchester's AA series is the perfect choice for a sporting clays session. 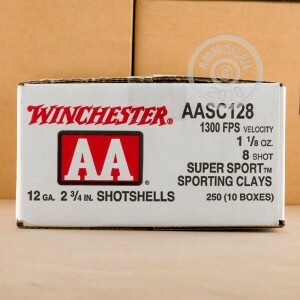 Each 2-3/4" shell in this box of 25 fires a 1-1/8 oz. load of #8 birdshot at a muzzle velocity of 1,300 feet per second. These shells are loaded in Oxford, Mississippi and use pattern-tightening wads, clean burning propellant, and dependable primers. These components offer an extra level of performance for only a very slight increase in cost. 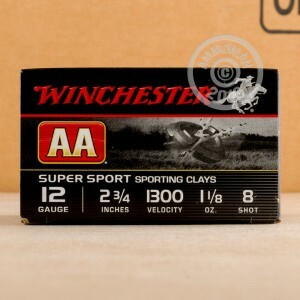 Stock up for a few clay sessions and get free shipping from AmmoMan.com if your order exceeds $99!